Josh Walker of the Green Bay Packers blocks Nick Fairley of the St. Louis Rams during the second quarter of their game at Lambeau Field on Sunday. This is a narrative that built a multi-billion dollar business, one that encourages supporters and inspires graphics that go viral. It keeps fans involved when their teams are struggling and brings them back each year. Even the Tampa Bay Buccaneers (2-14 in 2014 and 2-3 so far this year) think they have a chance in 2015. Each game is a new set of downs, a shot to continue a winning streak or turn around a flagging franchise. You either win or you lose. The excitement comes because your team has a chance to do both. But the “Any Given Sunday” idea — that any team has a chance to win any game — is less true than NFL executives want the fans to believe. Sure, you might see your favorite team go from worst to first over the course of a season, but that’s more a function of luck than anything. Teams play such a small number of games that they might have ended up in the cellar even though they weren’t that bad the year before. Conversely, even if a team stinks, it can luck its way to an 8-8 year. But beneath that luck, the NFL is much more unequal than Major League Baseball or the National Hockey League. Instead, it’s on par with the NBA, a league that’s dominated by its transcendent talents. That’s what we found by comparing leagues simultaneously, judging their competitiveness on the same scale. We turned to gambling to do it. While game results and win-loss metrics can be affected by scoring systems and number of games, sportsbook odds are the one unifying metric. In a world with perfect competitive equality, each team would have a 50-50 chance of winning. But as the gaps in talent between the teams grow, games are no longer a coin toss. For example, in Sunday’s contest between Green Bay and St. Louis, the underdog Rams were given roughly a 1 in 5 chance of emerging victorious. 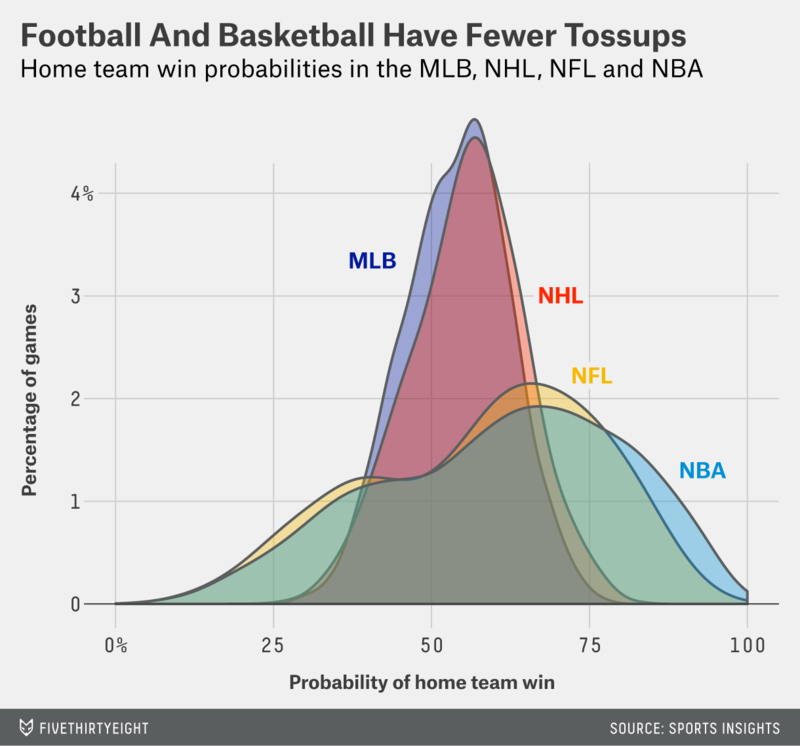 In the vast majority of NHL and MLB games, the home team’s chance of winning falls between 35 and 70 percent. That’s the big spire you see in the middle of the graph, and it suggests that the home team is never that big of an underdog or favorite. Many games, if not most of them, are a near 50-50 proposition. The curves for the NFL and NBA, though, are more spread out because fewer games in those leagues are tossups. The NFL’s curve may look even, but that really suggests that the games feature more lopsided matchups. Bad NFL home teams are bigger underdogs than bad MLB teams. Every week, there are several NFL games where you can be fairly confident which team is going to win and which is going to lose before they take the field for warmups. In hockey and baseball, even the worst teams are generally given a 1 in 4 chance of beating the best teams. Meanwhile, in the NFL and NBA, teams like the 2013 Jacksonville Jaguars and the 2014 and 2015 Philadelphia 76ers are sometimes given no more than a 1 in 20 chance by odds makers. And while only about 1 in 100 NHL or MLB contests feature a heavy favorite (75 percent or higher), about 1 in 4 NBA and NFL games reach such a standard. That is, about a quarter of NFL games each weekend are bigger mismatches than the most lopsided baseball or hockey games — think the Dodgers hosting the Phillies or the Sabres traveling to Pittsburgh. Parity in the NFL is perceived, a phenomenon born out of each season’s tiny sample size of games. Sabermetricians Tom Tango and Phil Birnbaum, for example, argue that you learn as much about true team talent from 12 NFL games as 14 NBA games.3 But while the NBA gives teams 82 regular-season games to prove themselves, the NFL provides only 16 games. It’s easier for a less-talented NFL team to luck its way into a few victories and make the playoffs. And the NFL’s playoff format, which can reward divisional winners at the expense of teams with more talent, helps, too. It means that the 2014 Carolina Panthers, at 7-8-1, can make the second weekend of the playoffs, a major marker of a successful year, even though few people would argue that they were one of the league’s best teams. In fact, they were a 7 to 1 underdog in their playoff game against the Seattle Seahawks. While the Panthers reached the postseason (after all, someone had to win the NFC South last year), they were given little chance to win a title. What’s also interesting about these results is that unlike each of the other leagues, which fix schedules almost entirely using divisional or conference affiliation, the NFL goes out of its way to encourage closer games by using an unbalanced schedule. When there are fewer games between the Pats and Bucs and more between perennial powerhouses like the Pats and Broncos — who have met in six of the last seven regular seasons — the league, on average, artificially narrows the curve in the chart above. Perhaps that’s a good thing for a league that relies on the myth of parity to keep supporters interested. If the NFL made its schedule following the rules used by other major sports, it might become abundantly clear to the fans that Any Given Sunday is only true in the movies. CORRECTION (Oct. 12, 1:30 p.m.): An earlier version of this article gave an incorrect time period for its analysis of pregame probabilities for major sports leagues. The probabilities were not based on all games since 2005; the time periods varied by league, and in several cases, games in recent weeks were not included. We have added a footnote clarifying the exact dates. The data set provided by Sports Insights included regular and postseason games for each league. The time spans it covered varied for each league. For the NBA, we had data from the 2004-05 season through 2014-15; for the NHL, 2005-06 through 2014-15; for MLB, the beginning of the 2005 season through Aug. 22, 2015; and for the NFL, the beginning of the 2005 season through Sept. 21, 2015. We used implied probabilities given pregame money lines taken from Sports Insights. For example, say the Steelers are -250 on the money line against the Jaguars. A bet of $250 on the Steelers to win the game would yield a $100 profit if the Steelers win. In probability terms, Steelers backers think Pittsburgh is more than 71.4 percent likely to win. However, the implied probability for this game also has to account for the sportsbook’s take, which is generally a tick over 2 percent. In our data, we normalized the team win probabilities so that they summed to 1. In the Steelers example, the -250 favorite matches a probability of 71 percent, or a true underlying probability of about 69 percent. 36 NHL games and 69 MLB games also meet the same standard.